Wonder Girls Dance "Tell Me"
Shad Valley UBC 2011 was surely an amazing experience for me, filled with countless surprised and unexpected adventures, including one in which I had to rediscover my dancing abilities! On the very last day of the 4-week program in Vancouver, some Shads (that's what we call ourselves) were responsible for organizing an "Open House" event in which parents, families and friends would come to our campus and see our House Projects (more on that in the next post). In the afternoon, there would be a "talent show" kind of performance by anyone who wanted to show off his or her artistic talents. Two weeks prior to the event, I somehow felt the urge to actually participate in this event, along with 4 other Shad girls. Normally at school I would never even think about auditioning for any type of show but the Shad environment was undoubtedly so different - to the point where all the stage frights, self-humilation, and lack of artistic talent were not for a second taken into consideration. I felt that the 51 Shads and a dozen or so Shad Staffs were really family and that I was more than comfortable to be surrounded by them, regardless of the situation. As a result, the 5 of us, formed the girl dance group called "Shad Girls" (inspired by Wonder Girls) and decided to learn how to dance to Wonder Girls' "Tell Me" song. Thankfully there were two Korean girls in our group who were naturally talented in kpop dancing and quickly learned the dance in segments. The two girls, Eunsu and Lisa, then taught the rest of us (me, Rose and Lily) the dance moves beat by beat. We practised tirelessly for 5 nights straight, with each rehearsal lasting for 2 hours. Moreover, the rehearsals were done after 10 pm each day since our program schedule was packed with activities from 8:30am-10pm almost every single day. 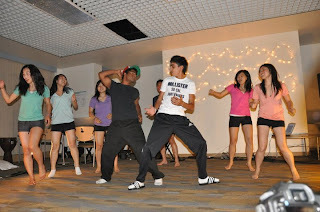 However, bit by bit, we slowly learned the entire dance and was able to put on a show as an entire group. Although we were far from perfecting our moves and our stage line-ups, we were all really proud of ourselves at the end of the day, to have finally been able to put this together in a week's time. Before our grand performance on the Open House day, we reassured each other that no matter how badly the performance goes, we are going to have fun on stage. In fact, that's all it mattered. Some of our fellow Shads were quite jealous of how much fun we were having on stage and so they jumped right up and joined us in the last 30 seconds of the show. The sight of seeing the 5 of us practising on our own was so ubiquitous that practically everyone picked up a move or two! DECA provincials was held during Valentine's Day this year so this journal is coming a little late. But hey, it's better late than never, right? In case you don't know what DECA is all about, let me fill you in on some basics. DECA used to stand for Distributive Education Clubs of America; however, today we just refer to DECA as an organization that gives students hands-on experiences in the field of marketing and business. "DECA prepares emerging leaders and entrepreneurs for careers in marketing, finance, hospitality and management in high schools and colleges around the globe." Since my future field of study will be something related to business, DECA is the place for me! The provincial competition has two components: 2 oral events and a written exam in the topic of your choice. Of course, you have to do well in regionals to qualify to provincials but all DECA competitions have a similar format. Last year, I had choosen Business Service Marketing and this year I had decided to go for something completely different: Restaurant and Food Service Management. As for the oral events, you get 10 minutes to read over and take notes on a case study, usually an issue of some sort that needs to be resolved. In the next 10 minutes, you are to present your solution to a judge. The written exam is simply 100 multiple choice questions with a time limit of 75 minutes. Well, although I did not place in the oral events, I felt a dramatic increase in both my confidence level and presentation skills. I clearly remember that last year I would be shaking with terror when facing the judges and was quite timid while presenting my case study. Doing so alone had affected my mark as anything I had said was not as convincing. I joined DECA merely for the learning process and to create for myself more opportunities to experience the real society. Chances are, 10 years from now I will be working in a business related firm and I will have to do some sort of an analysis on my company, resolve issues, present innovative ideas to my boss, etc. So why not start sharpening up these skills now? This is exactly what DECA can offer me and exactly what I want. Although I cannot say that I am 100% indifferent towards the results of the competition (as a semi-professional chess player for 9 years now, it's hard not to be highly competitive), upon reminding myself the reason for joining, I feel that this was nonetheless an amazing experience. Back in December, a friend of mine asked me if I would like to sign up for our school's newly introduced badminton intramurals. He explained that we would play for mixed doubles and that he simply needed a partner. My first reaction was: "Dude, I'm so bad at badminton, we're going to lose for sure." Considering that he was actually a good player, it would have been completely reasonable for him to withdraw the offer. To my surprise, my bitter response did not seem to bother him at all. "I don't care" was the reply. I then repeated my argument, emphasizing the duration of time in which I had not touched the racket, the rustiness of my skill and so on. It was only until last week that we heard some updates on the competition. Our first match was to be played last Tuesday, against two very solid players from our grade. As a strong-willed competitor myself (I've a semi-professional chess player for many years), I always strive to do well in every competition. However, this time I knew that skill was going to be the dominate factor in determining the winner and undoubtedly, the majority of the people who signed up were at least somewhat confident in their skills. We played the match and the results turned out to be exactly what we expected. No surprise here. It was a few days later that I had finally realized that this was a knock-out tournament, meaning that only winners get to proceed onto the next round. Well, I had certainly wished that a Swiss system was used instead so that by the end of the intramurals, I would have learned not to hit the birdie with the edge of my racket, to swing the racket at a better angle, etc. Yeah, if those were the things that I was learning, then you can surely imagine how bad I really was, hehe. If you ask me what are my favourite subjects in school, I would blurt out: "math and economics". Ever since I was in junior high school, I've decided that going into business would be the path for me. Now which aspect of business? Well, the one particular thing in business and economics that has always captured my interest is the stock market. Don't all these numbers and symbols fascinate you? Over the years, I've gradually picked up bits and bites of knowledge about the stock market from my parents, teachers and friends. However, that prior knowledge is so minimal that when actually trading in the Toronto Stock Exchange, I am utterly clueless about everything. Certainly, I am not trading with real money but rather a million fake Canadian dollars in a stimulated stock market that functions like the real one. What makes it even more interesting is the fact that I'm not just competing with myself to make a profit but also 40 other stock market enthusiasts in my school who joined this game called VP SMaC. I started investing in November and by now, I've managed to achieve a 12.4% gain, my best record so far. Such a percentage gain is still far from the one who has been holding the title "King of VP SMaC" for a while now (40% gain)! Anyways, my results have made top 5 out of 42 contestants so far, which is much better than I expected! Actually, when I began this challenge, I knew close to nothing about trading in a stock market. The most ridiculous part is, I never even knew what "shorting" meant! It was only after carefully observing other people' profiles that I noticed that there was a section in their profiles that said "Shorted Stock" and whenever the prices go up, they would lose money. I began to formulate a trend, which is the obvious - shorting a stock is the exact opposite of buying it; as prices increase you will lose money will when prices decrease, you'll make money. Shorting a stock is like borrowing money to sell the stock first, and then buy the stock later. Undoubtedly, a trader would want to sell high and buy low. So whenever you feel that a stock is at its peak price, you should sell short and then when the price drops, buy to cover the stocks that you had already sold. It's quite complicated to understand at first, but you'll get used to it after a while! I can't even remember the last time I went to a pool for exercise purposes! Perhaps the very las time that I swam back and forth in a lane was when we had the aquatics unit for my Grade 9 gym class. I went to my community centre's public pool from 9-10pm today, but the actual time spent in the water was 20 minutes. It's is a little embarrassing to say this, but I felt extreme fatigue after 5 full laps (50m/lap)! Now I'm convinced that stopping my Taekwon Do training classes had a significant impact on my body and health. I used to be able to balance this with a cross country season in the fall and a track and field season in the spring. However, I missed the cross country season this year because I was in Russia when most of the action was happening and since the track season is in April, I simply could not put off exercising any longer. Although the muscles in my left shoulder are tense and constantly in pain after the exercise, I fell great mentally! Exercising does pump more oxygen into the body's blood cells so it is natural for a person to be exhausted physically but fresh mentally after a good workout. I almost forgot about another important thing - hunger. I have a faint memory that when I used to swim in the past, my stomach would be grumbling afterwards and today's workout wasn't an exception either! I was quite satisfied after treating myself to some sunny side up eggs.Yum! Hey everyone, welcome to my blog! Who am I, you ask? Well, I'm just a normal teenage girl who is currently enrolled in the IB program. Never heard of it? This program is universally recognized and compared to the Ontario curriculum, it compacts 5 years of school (Grade 9-first year university) into 4 years of high school. Another very important thing that distinguishes the IB program from other programs is the dropout rate! During these 4 years of the program, approximately 60-70% of the students dropout before the end of Grade 12. This statistic is based on my school but from what I've heard, other schools' dropout rates aren't that much lower, if not higher. So what's the purpose of this blog? Well, before I answer that question I'll have to provide some more detailed background information for program (if you're an IB student yourself, you've earned yourself the right to skip this paragraph and jump directly to the next). The IB program really focuses on helping its students become well-rounded by encouraging them to get involved in activities outside of the classroom. Thus, one special requirement of the IB program is the completion of 150 CAS hours,that are equally divided into three categories - Creativity, Action and Service (notice my blog title!). Students are to complete these hours in 2 years, their junior and senior years of high school. Not only do we have to get signed letters proving the completion of hours in a certain activity, we also have to write CAS journals on a frequent basis reflecting our thoughts or emotions after having participated in a certain CAS activity. What activities you do is completely your choice; track and field, math club, volunteering in a hospital, painting masterpieces - these are just 4 of the thousands of different things that you get to pick from. Welcome to my blog! As Canada's top female chess player and the youngest ever Women International Master, it is in my best interest to spread this game to every inch of this nation. In June 2009, I founded the "Chess in the Library" program to promote chess. This is the second blog that I created for the purpose of enhancing my CAS journal writing experiences. Unlike my first blog (yuanlingyuan.blogspot.com), there is a variety of topics covered here, ranging from sport to stock markets! For more information on what this blog is about, check out my very first post here.